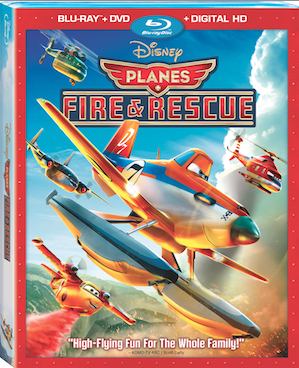 Planes: Fire & Rescue has flown into retail stores on Disney Blu-ray™ Combo Pack, Digital HD, Disney Movies Anywhere, DVD, and On-Demand! Want the inside scoop on Dusty’s new adventure? 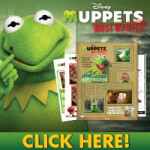 Here are some super fun movie facts and insider secrets! 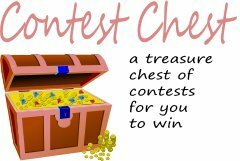 Movie Secret #1 – There are hidden meanings behind the numbers in the movie! Movie Secret #2 – A scene in the movie is based on a firefighter’s true act of bravery! 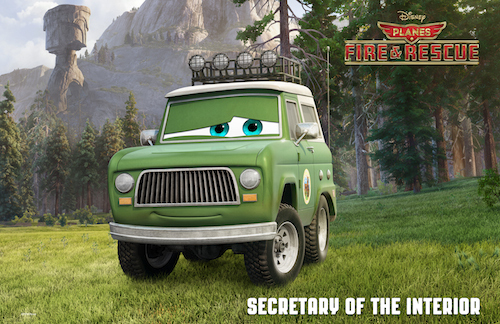 Movie Secret #3 – Piston peak National Park is based on a number of national parks! “We wanted to take audiences somewhere they’ve never been before,” reveals Bobs Gannaway. “The film has a little bit of Americana woven into a mash-up of Yellowstone, Yosemite and a few other national parks – all with our own distinctive spin.” Keep your eyes peeled when the action of the movie heads to the Grand Fusel Lodge of Piston Peak. The quirky building was directly inspired by Yellowstone’s iconic Old Faithful Inn! Movie Secret #4 – Julie Bowen signed up for the sequel before the first PLANES film was even released. Movie Secret #5 – It took a team of 900 people to create the movie! 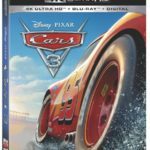 Movie Secret #6 – Real vehicles often inspire the character design! Most of the high-flying vehicles in the movie are fictional, but their design is usually inspired by real aircraft. The look of Dusty Crophopper was inspired by three planes: the Air Tractor 502, the Cessna and the Air Dromader. The design of Windlifter was inspired by three helicopters: the Sikorsky Skycrane, the Kamov KA-26 and the Mil MI-10. Many of the land-based vehicles are also based on real automobiles. The design of Mayday – Propwash Junction’s feisty fire truck – was based on the 1940s Fordson Tender. Movie Secret #7 – Julie Bowen panicked in the recording booth! Movie Secret #8 – An aerobatic helicopter pilot assisted the animation team! Movie Secret #9 – Piston Peak’s mechanic tug is named after a real mechanic! Movie Secret #10 – Dane Cook would like to see a musical PLANES movie! Movie Secret Extra – More than 2 million trees populate Piston Peak National Park! One of the many difficult tasks that the filmmakers tackled was the creation of Piston Peak National Park. “It was a huge challenge for the art team,” explains Bobs Gannaway. “And more than 2 million trees were incorporated into its design.” The animation team ensured that just the right trees were incorporated into the scenery – including lodgepole pine, ponderosa pine, incense cedar, red woods and giant sequoia! 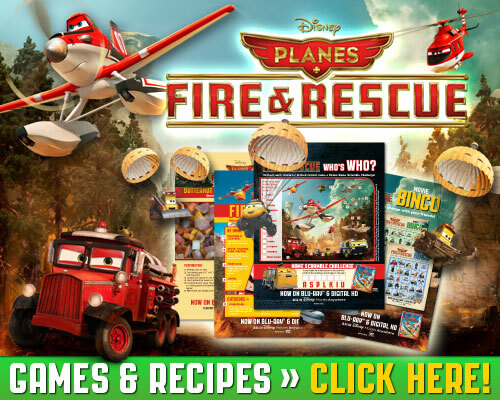 To celebrate the release of PLANES: Fire & Rescue on digital, Blu-Ray and DVD, here are a few PLANES-themed sheets filled with cool games and activities! Learn how to make a sweet butternut squash apple bake, get some fire prevention safety tips, play “Who’s Who?” with your favorite Planes characters and get ready to win with Movie Bingo! “PLANES: FIRE & RESCUE” is about second chances, featuring a dynamic crew of elite firefighting aircraft devoted to protecting historic Piston Peak National Park from raging wildfire. When world-famous air racer Dusty learns that his engine is damaged and he may never race again, he must shift gears and is launched into the world of aerial firefighting. Dusty joins forces with veteran fire-and-rescue helicopter Blade Ranger and his courageous team, including spirited air tanker Dipper, heavy-lift helicopter Windlifter, ex-military transport Cabbie and a lively bunch of brave all-terrain vehicles known as The Smokejumpers. Together, the fearless team battles a massive wildfire and Dusty learns what it takes to become a true hero. 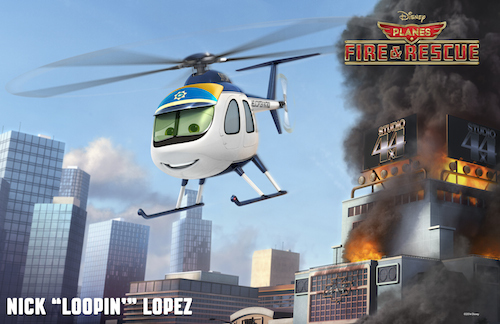 Stay connected with the latest news and information about Disney’s “PLANES: FIRE & RESCUE”! Like Disney Planes on Facebook, and follow Disney Pictures on Twitter. Be sure to check out the PLANES Fire & Rescue website, and visit DisneyMoviesAnywhere.com and download the App! What a good review of this movie…now I know that we’ll want to see it! The Activity sheets are great…thank you! Sounds like a great movie. Reminds me of Cars. My girls love character activity sheets. we have not watched this movie yet! my kiddo loves cars so i am sure she would love this one as well. Those are some interesting facts. I know the grandkids love this movie. I didn’t know any of those facts. Unfortunately I have not seen this movie yet. These will be great quiet time activities for the grandkids. 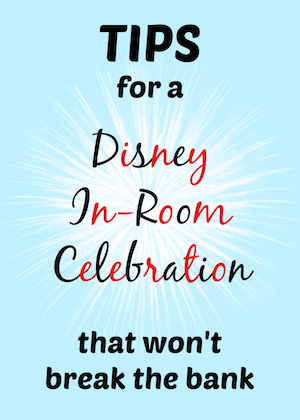 These are some great things to know–my son absolutely loves this movie! i would love to get my toddler to watch this i bet he would love it hes into planes and trucks right now!! Oh my!! My nephew love this movies. I see at least twice a week.